I’ve had a somewhat atypical Chinese New Year so far. For one thing, our reunion dinner was at Gordon Grill at Goodwood Park Hotel, where the only yu (fish) consumed was in the complimentary salmon appetizer — no customary yu sheng in sight. 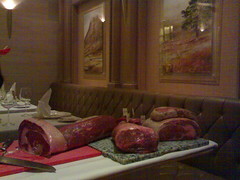 Instead of a whomping nine-course Chinese dinner, we had a la carte steaks, sides and starters from the regular menu (yum!). Instead of having to rush through dinner in less than two hours so that the restaurant could seat the next serving of diners, we had a leisurely meal with impeccable service. Anyway, here’s a roundup of some of the more typical festivities that went on in Singapore. panaphobic documents the maddening crowd getting together to prepare (and enjoy!) their reunion dinner. gecko and the family make their annual visit to the popular Kwan Im Thong Hood Cho Temple on New Year’s Eve. bma, an American relocated to Singapore, gets some yu sheng. Ol’Dan‘s comic strip takes a humorous look at the hazards of visiting the relatives.